If you haven't heard, Ottawa just got a little more purrfect. We had the pleasure of helping the Feline Cafe become a reality and now it's one of the most fun and playful cafes to visit here in Ottawa. From research and designing concepts to production, we were a big fan of this cafe project! See below for more details on the progress and final product. The Feline Cafe is a space dedicated to the love for animals. Not only is this a place to encourage the adoption of homeless cats, this cafe also serves vegan food options. 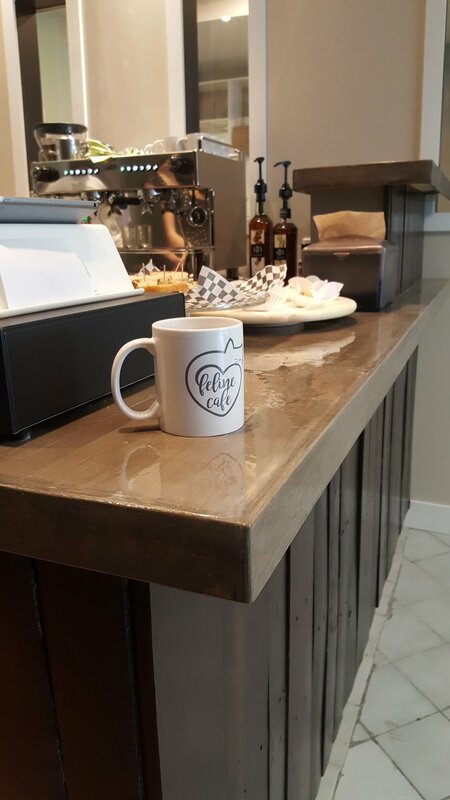 To represent the natural and loving values of this cafe, we chose to use natural materials and a heart inspired logo. Humans aren't the only clients at this cafe! That's right! We designed this space to appeal to our feline friends as well. Keeping in mind the physical capabilities of all cat ages, we designed fun cat structures at all heights with spaces for them to hide in and relax. Our favourite cat structure is the cat maze featuring a tunnel, shelving with holes in them and the tallest perch in the cafe. We chose coffee sack burlap as our accent material. We didn't just choose it because we were designing a cafe space that sells coffee, we chose it because it's a natural looking material that becomes 10 times more beautiful when light shines through.